Naturally, a game about jam is the simplest gamejam game you could make. 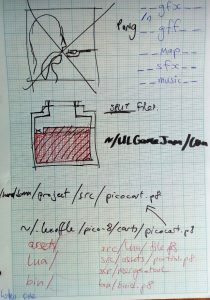 Here’s a little breakdown of the team and our process for the gamejam. For UL Gamejam 2 I joined a team with Dave Ryley and two of his brothers, Brian and Jono Ryley. Dave is a veteran game jam enthusiast, but this was both Brian and Jono’s first experience of a gamejam. Luckily we got a great theme for the first-timers; “Simplicity”. Together we made Jam, The Game. Naturally, a game about jam is the simplest gamejam game you could make. Our game won the popular vote at the end of the jam, which was a wonderful achievement for our team! We walked away with some great prizes; a JetBrains 100% discounted license and some great books – like A Theory of Fun – which should have a place on every game designers bookshelf. 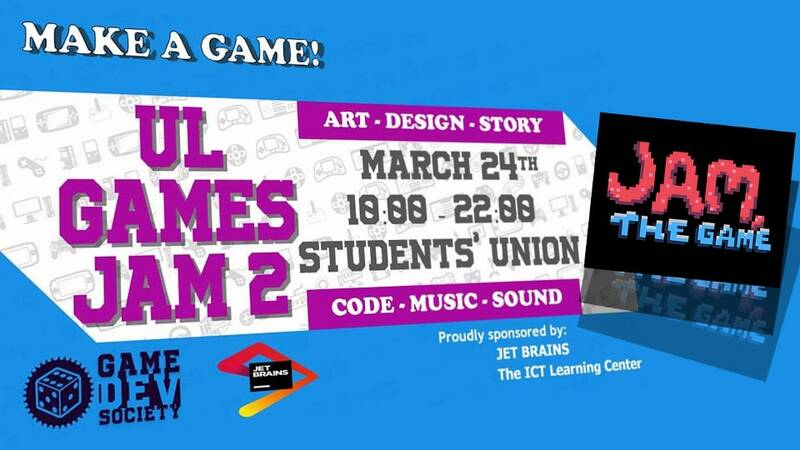 A big thanks to UL Game Development Society for organizing all of this. Dave thought about making a Let’s Play of your gamejam game because we had finished nice and early. Make a Let’s Play of a gamejam game at the same gamejam? Sounds fun to me! Luckily Dave had nearly everything necessary on his laptop to capture his screen and record audio of us talking. As it only took about 10 minutes to get it together and upload it to Youtube, this has become a goal of ours for each gamejam we do from now on! Enjoy! To be fair, Simplicity is a great theme. “Simplicity” inspires one to focus on a minimal game – something achievable in the limited time. Let’s cover some details about the jam itself. Can it be done quick and dirty -> Yes -> DO IT! The theme announcement followed: Simplicity. The message was clear and concise! Now to get down to business. 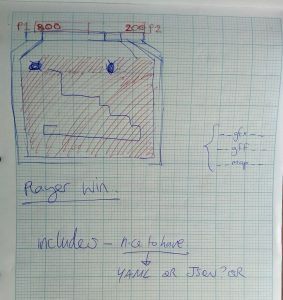 Planning out the game, quickly! 15 minutes. We had one idea, chatted about it, and it was already way too complicated to make in PICO-8. Remembering the tips above, using them as a kind of razor, we came up with a super simple game like dig-dug. I showed the team a YouTube video of the ancient arcade hi-score chaser of my youth. Let’s just make a simpler version of that! Here are some of my notes from those early moments. Each of us discussed what we would like to be working on for the game, and what roles we felt capable of doing. I was impressed by the go-getting attitude of the first-timers. Dave helped set up Brian and Jono with source control. We used git, which was also a first, but Dave helped set them up and I wrote out a little cheat sheet of commands. You can actually access the public git repository here: https://github.com/dwarfplumber/ULGameJam2 and you are welcome to fork it. Working at the same desk it was easy to say to each other what we were going to work on next and negotiate the best course of action. When I realised we would have a bunch of different carts going, but have clearly defined carts for different roles, I thought of making the collaboration tool and wrote that first. The gamejam version is likely still in that git repo. We worked away happily, headphones in or out, chatting amongst ourselves as need be. Each team member knew what they had to do and so we simply got to it. Taking time for a break is important. We took them as we needed to, as a team or individually. UL Game Dev Soc provided pizza twice during the day’s scheduled lunch and dinner times. Quite a welcome treat! At the wrap up of the jam, each of our team members remarked that they felt they had not done enough. Even Dave felt this, oddly enough, as he not only helped his brothers but also did a lot of the leading on the team – in my mind at least! Overall I think this feeling meant we worked well as a team. Nobody felt that they did all the work, and everybody contributed important things to the game. That’s a win! Let’s Play Jam, The Game!